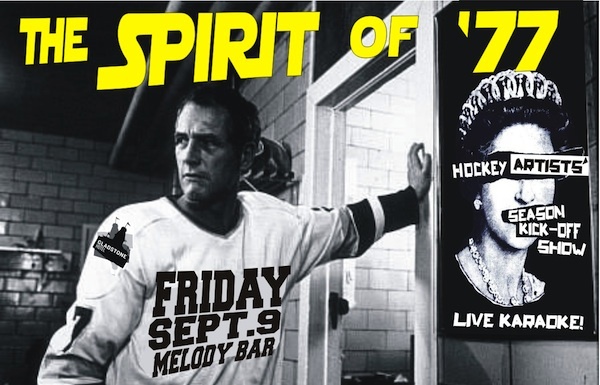 TORONTO - The Gladstone Hotel's Melody Bar is set to host a kick-off party for the new hockey season next month. Organized by members of Toronto's various arts-inclined hockey leagues, the event will feature live karaoke and a thematic send-up of the classic 1977 hockey film Slapshot. All are welcome to attend and encouraged to get up and sing their favourite tracks from 1977. (Interested in singing? Send a note to uuhadood@gmail.com for a song list.) The second in a series of events that saw revellers first gather a few months ago to celebrate the hockey film Youngblood in song, Spirit of '77 takes place Friday, Sept. 9 and will be a pay-what-you-can/pass-the-hat affair. Hope to see numerous UUHA'rs there.